Shawl is the piece of cloth that is used for covering head and shoulders or wrapped around the body. The shawl is such accessory that is coming back to fashion. Shawl is the most versatile, simplest style to wear and it looks good when girls wear it.Shawls is mostly used with jeans, plain shirt, and pair of smart shoes. Traditional way to wear shawl: Wrap shawl around the neck and loose it from one end on both sides. Use of brooch to secure the shawl is best ides it will look good. Leave one shoulder uncovered. Pull the sides together at the side and join them with a brooch. Remember to double fold the edges where you join them so it is more secure. Use of belt with shawl: A shawl adds elegance to your look of women. Put shawl on both shoulders equally. You may have to put the belt on the shawl and hat if you use this as fashion inspiration. It can be done with any color of that is in fashion. It will look simple and will look beautiful. Knot the shawl: Knot style is one of the simple styles. Knot style is suitable for short shawls. Put the shawl around the neck and tie it up in the form of knot. Wear long coat over it, it will look decent. Evening shawls: In winters dark colors looks beautiful. If you are wearing shawl in evening it’s best to go with a color that will accessorize the majority of your outfits instead of just one. Less formal wear: These shawls are easy to wear. Do not keep the evening shawls just for formal events. Put shawl on the body when you go out in some different style in cold weather like on family dinner or party. Wear shawl like a scarf: Fold the shawl in the form of a triangle, just like a scarf. Wrap the scarf around your neck and tie it loosely in front. To keep the shawl from unraveling you can tie the loose ends with a brooch. Brooch will adds beauty in the shawl. 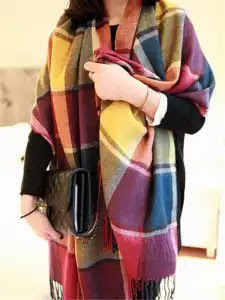 There is another tips to wear shawl in different style fold the shawl the long way, like a rectangle. Place the middle at the front of your neck and let the ends hang loose over each shoulder. Wear shawl as a coat: If you want to wear the shawl as a coat wraps it over the shoulder and let it hang loose. If you are worried about the shawl slipping off, then tie the ends behind your back to keep it in place. 0 Komentar untuk "FASHION TIPS FOR SHAWL"